A question I imagine a lot of people have about Gunpla is "where do I start?". This is what I was thinking when I started; there are so many kits out there and they come in all different sizes and levels of complexity. Everyone is different so there's no one answer to this question, but I think I can give a pretty good general guide that will be simple, not take a ton of time, and serve as a good litmus test that if followed will tell whether you will be interested in the hobby or not. Do you have patience? Building Gunpla can be exciting (a different kind of excitement than the adrenaline filled word of say, base jumping or tax evasion), but most of the time it involves simple repetitive tasks. If you are typically short on patience Gunpla may serve as a good exercise in building patience. On the other hand, spending a few hours making 12 identical parts will come easier if you have a little patience and can envision what the end product will be. Ok, so if you've made it this far then you're probably still interested in making little (and moderately big but impeccably detailed) plastic robots. Yay! Gunpla for me is relaxing, frustrating, a great creative outlet and sharpens my cognitive problem solving skills. The question now is where to start. I recommend starting with a simple kit that looks great once built but isn't too complex. The High Grade 1/144 scale RX 78-2 revive is an excellent place to start. 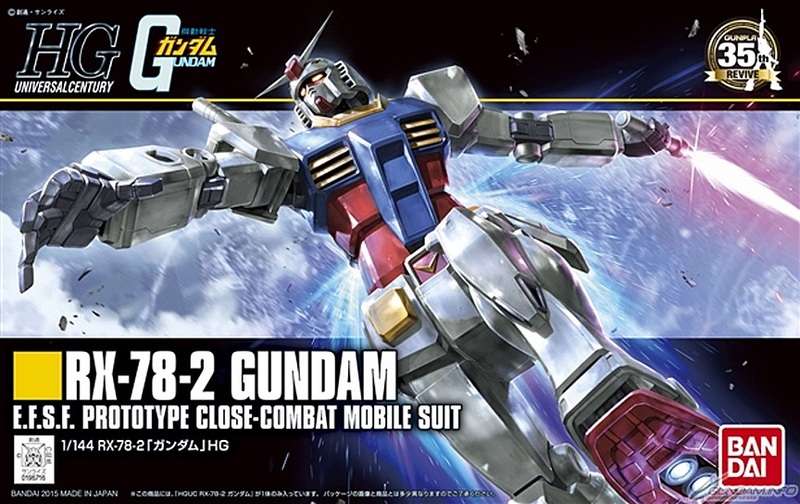 This Gundam is commonly referred to as the "Grand Daddy" as it was in the original Anime, and has been the base of every Gundam design since 1979. It's like a classic car. This particular kit is simple enough to assemble but gives a good idea of what is possible in the areas of articulation and finished product. So now that we've got a kit tentatively picked out for you it's time to talk about tools. There are a plethora of tools out there for modeling, but you really only need 2 to start; you can even get away with just one. I'd recommend starting with a pair of side cutters and a sharp hobby knife. That being said, GREAT NEWS: you can get away with just a hobby knife, which you may already have lying around somewhere! Gunpla kits are meant to be snapped together without glue, and are already colored so no paint is required. The fundamental skill of building Gunpla is removing the "nub" marks from a part after you separate it from the runner it comes on. In my opinion, this is a basic skill but difficult to master. Nub removal is what everyone struggles with the most when they start and mastery of this skill is the mark of a top level Gunpla builder. There are tutorials for removing nubs available here, and here; and this is an excellent video tutorial. So what are you waiting for? Let me put this to you: if you're willing to spend less about $15 you can get a great taste of a hobby that's been around since 1979, has a solid community building around it, is currently rising in popularity at an accelerated rate, and can be artistically rewarding. Don't think about how expensive the more advanced kits are, or making space in your living area for a paint booth, or what someone else will think of your first build; just focus on getting started and have fun! I hope reading this has sparked your curiosity. If it hasn't, maybe check out some of the kits I've posted on this site, or just google "Gunpla". If that still doesn't pique your interest then that's ok too! Gunpla isn't for everyone; just like being a teacher or a Presidential candidate. If you are interested, then plop down your $12 for your first kit and come join the fun!